Please join your UFV Advancement Team at our Thank You! Open House. We hope you will drop in for tea, coffee and treats to give us a chance to thank you in person for your loyal support of UFV students. 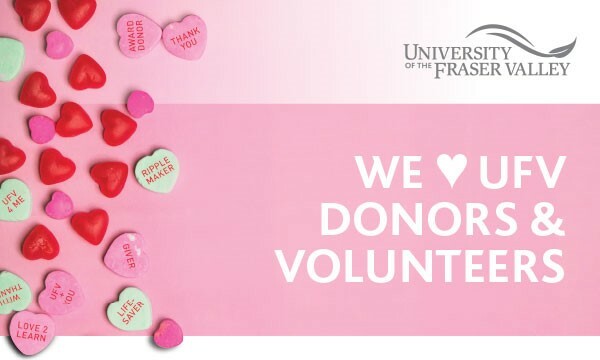 We have chosen February — a time of warm wishes, hearts and chocolate — for our donor and volunteer appreciation event. Note: No speeches, just warm conversations, light refreshments, and a chance to learn more about how your contributions are making a difference in the lives of students!